To purchase the Atlas 3 Stall Roundhouse scale model manual on printed paper click this PAYPAL button. 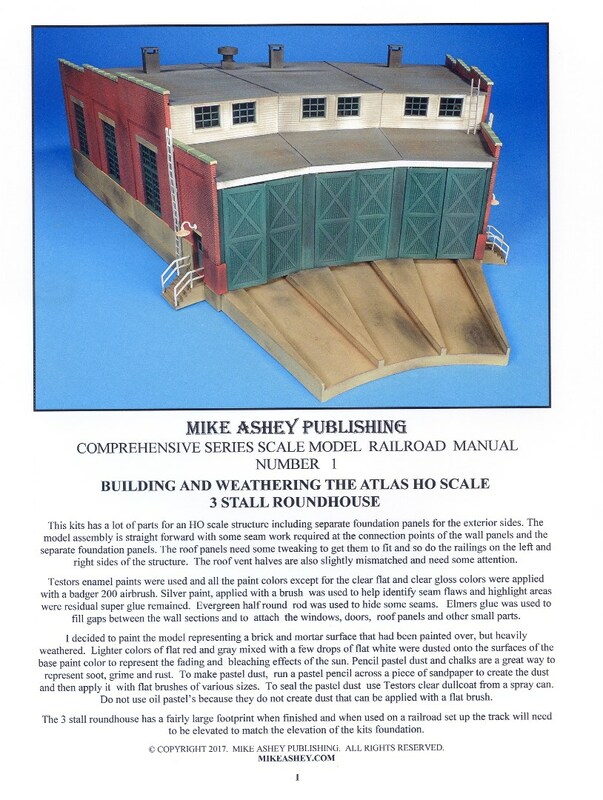 To purchase the Atlas 3 Stall Roundhouse scale model manual PDF click this PAYPAL button. The Atlas 3 stall HO scale roundhouse has more foundation parts than is typical for a model railroad kit. This comprehensive series manual shows you how to assemble the kit in the proper sequence so that the fit and gap issues can be easily fixed during the assembly and painting sequences. This manual shows you how to use Elmers white glue as a filler for small seams and gaps during the assembly sequence. Medium weathering is applied as the model is assembled especially to the interior using pencil pastel dust. Various shades of exterior colors are also applied to demonstrate how surface paint can provide a weathered appearance to a model.